Twenty million years as a resident of planet Earth, and counting…. Scientists believe that the American alligator (Alligator mississippiensis) resembles animals that inhabited our planet as long as 100-150 million years ago — and that they may be linked to creatures dating 50-65 million years ago, managing to avoid the extinction that killed off the dinosaurs, their prehistoric contemporaries. 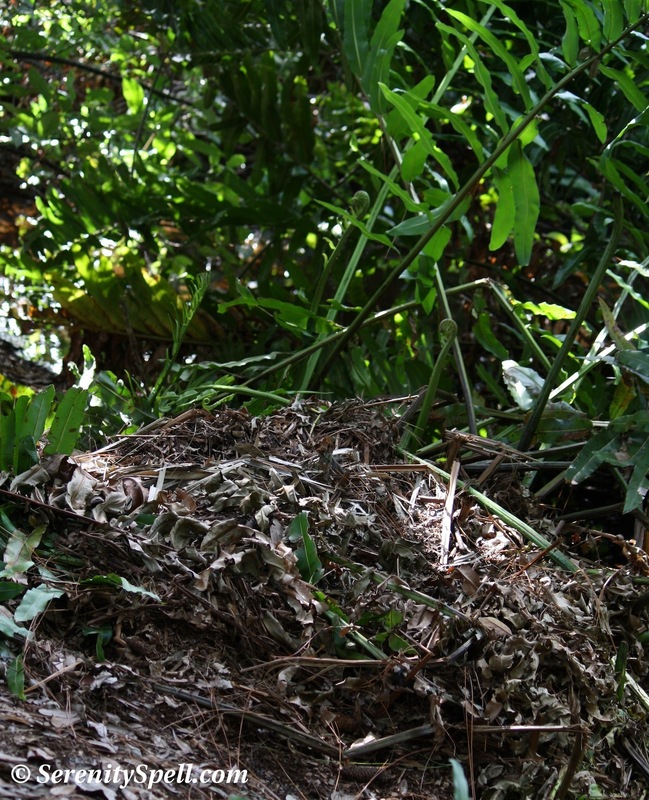 It’s always wise, and healthy (wink) to know what a gator nest looks like (see below! ), if you’re a hiker in our area — momma will most definitely be nearby! Yikes I think cougars and black bears are easier to navigate. Really informative post and detailed photos. I enjoyed this post, and I agree with you – LEAVE WILDLIFE ALONE. Human beings perpetrate so much destruction on other species on this planet, it just get to me, sometimes. Why, oh why, oh why don’t human beings see the error of their ways? Thank for a fantastic post. Seriously! While many appreciate the natural order and its critters, I’ve witnessed some horrific events — especially with the alligators. It’s like the school bully going after the big, quiet kid. Fierce, scary reptiles? Let’s torment and maim! IDIOTS. (Well, I have other words for them…) Glad you enjoyed tho! I agree; I find them absolutely fascinating (and maligned) critters. And, VERY primitive in their appearance — seemingly little-evolved from those millions of years! 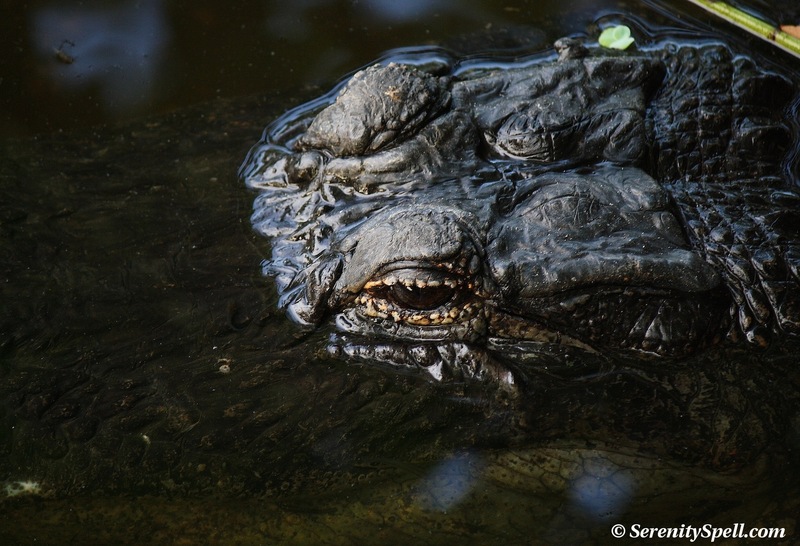 They’re quite a sight, hiding in our swamps — talk about a prehistoric vibe. Interesting! They are very prehistoric looking. VERY much so — seemingly little-evolved from those millions of years! They’re quite a sight, hiding in our swamps — talk about a prehistoric vibe. Outstanding! 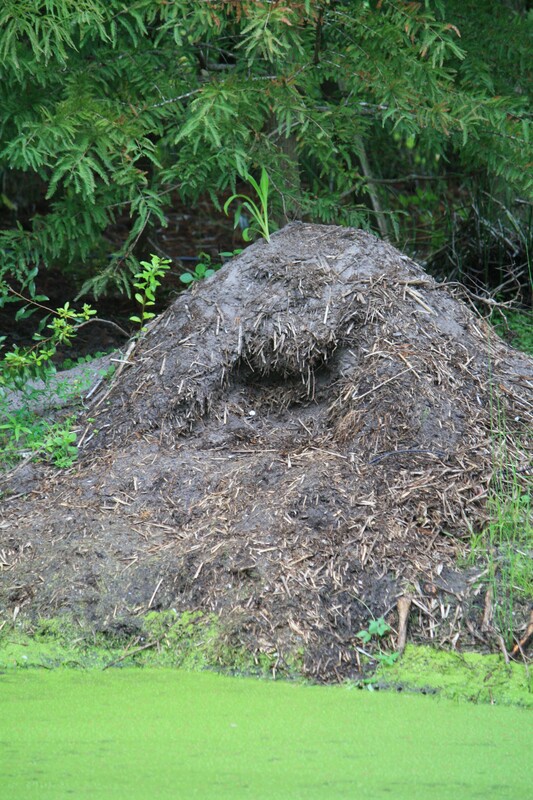 I’ve never come across a gator nest in the wild. Still hoping for a picture of mama with baby gators! They’re so well camouflaged — but when we see one, we’re always immediately on guard, because we know momma’s around! I do have a few pics of one momma and her babies from a few months ago (3?) in “Alligator Babies” — https://serenityspell.com/2012/04/25/alligator-babies/ — but I can’t wait for the next round!! That’s a nice pair of shoes!! Just kidding, of course. 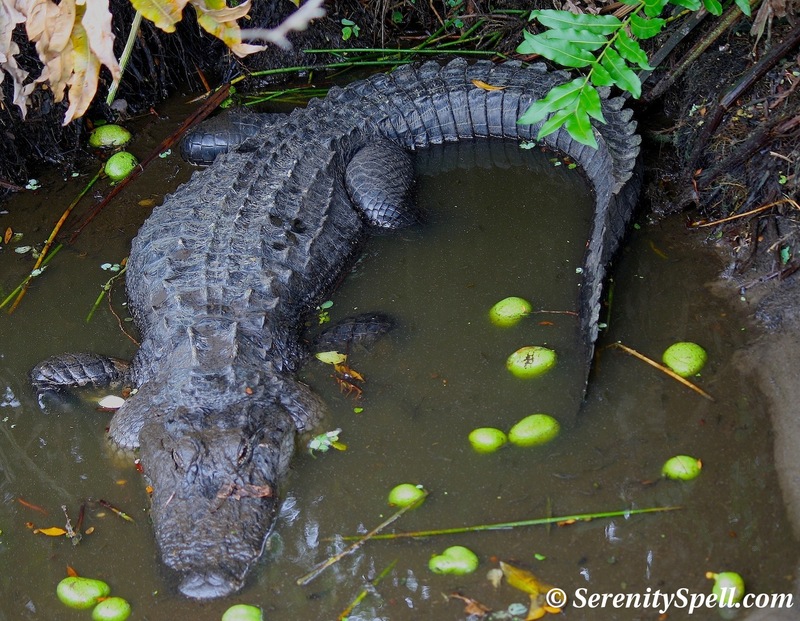 Gators used to show up in my neighborhood lake from time to time (Louisiana). Wildlife and Fisheries agents would catch them and relocate them. Scary creatures! Oh my! I love living in the swamp! I am so happy there are noone like this around here. Interesting. Hee… I think it’s what one’s accustomed to! I’ve been hiking in areas with bears (something we’re NOT accustomed to), and I’ve been in a complete panic! 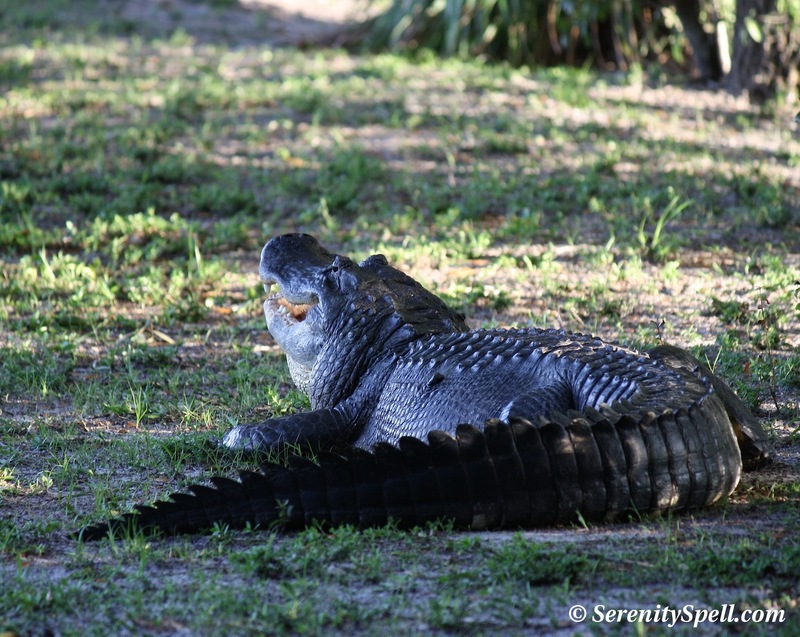 I enjoy taking photos of alligators… they are truly photogenic, strange as that seems. I understand the fear factor, however. Big snapping jaws and ever, so ever primitive. They can be easy to miss, if you’re not looking (especially with all the vegetation around here)… But if you’re keen to the time of the year, and the nearby environment — you definitely want to be a bit heads-up when you see one! I have to admit they are beautiful, BUTTTT-not too eager to run into that on a hike! The worst we see on a hike may be a timber rattler! Possibly a mound near the water but just a beaver:-) You really do need to know what you are doing to hike near those creatures. They sure are stunning! I did walk over a huge timber rattler when I was hiking with my son ( he was 5 at the time) and I walked over the snake he slid between my legs ( the gap). My father is not the type to jump he grabbed my son and yelled at me since I was a few feet ahead. I turned and looked at the tail end ( his rattle-YIKES-he had more than a few) of the snake going into to the green area along the path. His markings were beautiful! He was going towards the water and I was not a threat our paths crossed-literally-LOL. I was jumpy all night for he was HUGE and now when I hike at my parents place, I am looking at the corners of the path all the time! I’ve heard about that phenomena — and how it’s all tied to their disappearing habitat, and food sources (invasion bugs eating their berries by the thousands upon thousands of acres through North America)…. I would be terrified, though!!! My aunt told me that you can’t even leave a stick of gum on the window sill for the bear smells it and will come in through the window (Tahoe-Calif)! All her grandchildren know-” do not leave a pack of gum on grandma’s window sill”-:-) Or ELSE!